Gary Mackay-Steven has impressed in the early games this season. 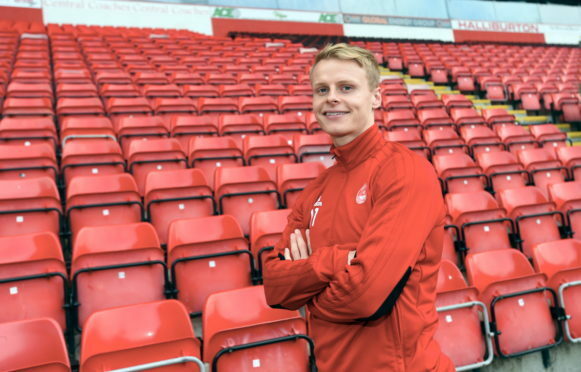 Gary Mackay-Steven’s improved performances this season come down to the wide man feeling like a key player again. That is the view of Aberdeen manager Derek McInnes, who is full of praise for the way Mackay-Steven has stepped up his game so far this season, even though he had an impressive first season with the Dons. The former Dundee United and Celtic winger picked up the man-of-the-match award on Saturday against Motherwell and has been a more consistent performer since the start of this campaign. He has become the Dons de-facto penalty-taker since the departure of Adam Rooney and has been a consistent threat down the right flank. McInnes said: “I thought he was good last season. He got 10 goals which for a wide player is a fantastic contribution. You get bits of inconsistency with wide players but he had a good first year with us. He was influential in the Burnley games and carried that on. It’s important for us to have that type of player, who can unlock defences with speed and creativity. “I’ve always thought he was a calm finisher in good areas. He’s added goals which adds to the perception of being a key player. I think he feels like a key player again like he was at Dundee United, which he maybe hadn’t done for a couple of seasons. Aberdeen head to Easter Road tonight in the Betfred Cup quarter-finals, taking on a Hibernian side who grabbed a late point against the Dons in the league last month. After three points against the Steelmen and a trip to Celtic Park on Saturday, a big week lies in store for McInnes’ side. He added: “I’m not caring about any statement of intent, I just want us to try and take the opportunity that is ahead of us. We’ll take the confidence from Saturday’s game in terms of getting the points but we’ll also see the opportunity of getting the club into a semi-final.